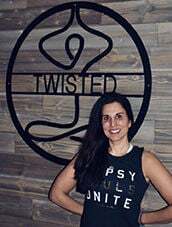 Jackie Stewart says opening Twisted Yoga and Barre Studio was the best decision she's ever made and hopes to spread the benefits of yoga to her students. Jackie Stewart has been a self-proclaimed “fitness nut” for the past two decades. And the title isn’t for naught. Her obsession with fitness started when she took her first step aerobics class in high school. The rest is history. In fall 1998, Stewart left for college at Clarion University and was determined to avoid the "Freshman 15" ­— the number of pounds many women supposedly gain when they first go off to college. “I went to check out the group fitness schedule,” says Stewart, who today owns Twisted Yoga and Barre Studio in Hermitage, Pennsylvania. “It was there that I saw the sign for a part-time aerobics instructor. I auditioned, got the job and over winter break for my 19th birthday my parents paid for my first group fitness certification." That was the start of Stewart's fitness career. Little did she know her part-time job would mold her future, introduce her to some of my best friends and become her life's true passion. After graduating from Clarion, Stewart got her first adult job as a fitness director. She wanted to learn everything she could about fitness and all the evolving trends. “I would spend almost every weekend at a fitness training or certification,” she says. But she admits she at first had a love-hate relationship with yoga. Stewart's been teaching yoga for the past eight years and credits the practice for changing her body, as well as her perspective of life. The studio opened in September 2013 and offers hot power yoga, beginner yoga, yin yoga, barre, and stand-up paddleboard yoga at Lake Julia in Buhl Park during the summer. Many clients have been attending since opening day. “We also do a donation class once a month where 100 percent of the donations go to a local charity,” Stewart says. Movements are influenced by classical ballet barre methods, Pilates and orthopedic exercises, according to Stewart. The goal is to feel less stressed and in a better mood. And her family totally supports her. As for her love-hate relationship with yoga? It’s a distant memory. As a yoga teacher, Stewart tries to show students their potential and strength. She values the opportunity to help each person with what he or she needs that particular day.